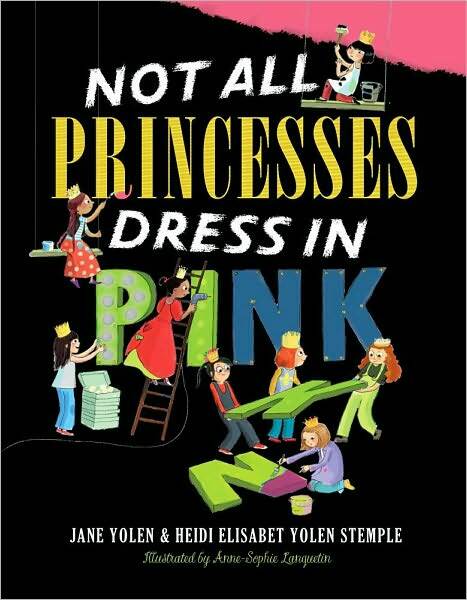 Not All Princesses Dress in Pink by Jane Yolen & Heidi E. Y. Stemple. Illustrated by Anne-Sophia Lanquetin. Simon & Schuster Books for Young Readers, 2010. Currently available. Face Value: This cover is amazing. The girls are hard at work turning the cover from a pink monstrosity to an eye-catching multicolored billboard. I like that the cover conveys the fun, positive tone of the book. I like that it’s appealing not only to very young girls but perhaps also those readers who may have outgrown picture books, but enjoy a good read-aloud every now and then. Does it break the slate? Yes, but not in a way that will shock or offend. It is a gently Slatebreaking book. Although I am a fan of the bold and brassy Slatebreaking character, I also understand that we need books of a more moderate tone to advance the idea that girlhood is not easily defined. Who would we give it to? This is a great book for any very young girl who may have been teased or criticized for not fitting into someone else’s idea of what a girl should be. It could also be a great gift for the “very princessy” girls who wear tulle and tiaras on a regular basis, and may need a book that encourages them to broaden their concept of what it means to be a girl in power. Review: Sometimes the simplest concepts can be the most effective. Jane Yolen and Heidi E. Y. Stemple’s Not All Princesses Dress In Pink uses a simple rhyme scheme and some thought provoking illustrations by Anne-Sophia Langquetin to challenge the social norms of girlhood. It is a fun book – some may call it picture book fluff – but I think it does a great job of encouraging alternative ways of thinking about femininity. Each example of a princess wearing apparel and footwear appropriate to her chosen lifestyle is followed by the tag phrase “…and a sparkly crown.” I must admit that upon first read, I was irritated by this addition to each example. Why couldn’t a girl in a baseball jersey or a suit of armor be awesome and special, even without a crown? But I took a second and third look at the book, and I appreciate what Yolan and Stemple are trying to do. They are taking the princess frenzy that Peggy Orenstein writes about in Cinderella Ate My Daughter and playing with the notion so that young girls can experience some consciousness-raising. Although I may not be the princess type myself, I can certainly see the value in sharing this book with young readers. I love that illustrator Lanquetin showcases all types of girls throughout the book. The characters are racially diverse and have interests ranging from soccer to shoe shopping to farming. The illustrations are lively, which captivated me as a reader. There are no passive princesses in this story. Each girl depicted is moving, shaking, and actively engaging in her world. If you feel that a new bedtime story is needed in your household, Not All Princesses Dress in Pink would be an excellent option. It is lighthearted enough to end the day on a happy note, and its easily memorized rhyming pattern will engage the minds of children who are developing their reading skills. This entry was posted in Picture Books, Reviews and tagged Little girls, picture book, Princess Culture, Princesses. Bookmark the permalink.